Last week, a group of 45 elk arrived in Virginia’s Buchanan County. The pack was the last transit of the animals from nearby Kentucky as part of Virginia’s Elk Management and Restoration Plan, which has a short-term goal of raising the state’s elk population to 400 individuals. The restoration program, which is funded by the RMEF, initially called for 75 elk to be relocated from Kentucky when it was launched in 2012. This latest group of elk to reach Virginia is by far the largest transported across state lines in the last three years, and will be joining a herd of about 30 animals already living in the state. Wildlife biologists are now keeping a careful eye on the elk, who have mostly stuck to the several thousand acres of of private and public land in Buchanan County allotted for their use. This is not the first time that the state has tried to reintroduce elk. Virginia wildlife officials imported elk to 11 counties back in in 1916 in an attempt to restore a native population, but those releases failed. By 1926, only two small herds remained and managed to eek out an existence until the 1970s. By that time, disease and extreme isolation drove the elk once again out of the state. Virginia used to be home to a vast number of elk, but habitat loss and unregulated hunting caused the species to become extirpated in the late 1800s. Drawing inspiration from successful restorations in Kentucky and other states, biologists are hopeful that this attempt will have lasting results. The Virginia Department of Game and Inland Fisheries is considering bringing in elk to other counties as well. Wildlife officials say they are aiming for a sustainable population large enough to facilitate hunting within four years of the last release. 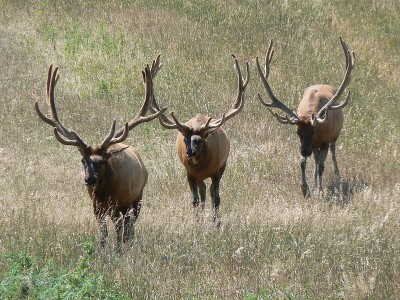 Proceeds from the sale of hunting permits will go back into conservation efforts for the elk.